Regularly clean your granite countertops with a neutral cleaner, stone soap, or mild liquid dishwashing detergent and warm water. Too much cleaner or soap may leave a film and cause streaks. Rinse the surface thoroughly after washing with the soap solution and dry with a soft cloth. Do not use scouring powders or creams that can scratch/etch the granite surface. 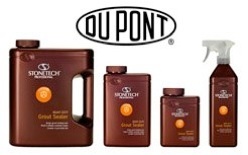 A product we recommend is Dupont Stontech Professional Revitalizer. Its neutral cleaning agents are specially formulated for us on granite countertops, and it also leaves behind a protective seal every time you clean. Oils are particularly damaging to stone surfaces. Make sure to wipe up cooking oils in the kitchen and cosmetics in the bathroom. Acids can etch or dull marble and degrade protective sealers. Take special care with citrus drinks and alcohol, as well as perfume, toothpaste and mouthwash. Don’t use general purpose cleaners or products containing vinegar, bleach, ammonia or abrasives on marble. Granite is not affected by these products. However, long term usage could have adverse affects. Don’t use acidic or alkaline cleaners, except for those specifically formulated for use on natural stone or granite countertops. Your natural stone should be sealed at the time of installation. Depending on the porosity of your stone, countertops and low traffic areas should be sealed every 1 to 3 years. High traffic and wet areas such as showers should be resealed every 6 months to a year. Restoration calls for the knowledge and experience of a professional. With regular maintenance, natural stone surfaces may never have to be restored or refinished. But when its time for new life for you stone, call a professional. We recommend Marble Restoration Services at 816-358-6426.